Northern Bay Golf Resort and Marina is an 18-hole regulation length golf course in Arkdale, Wisconsin. This championship layout provides for a fun golf experience for golfers of all skill levels. Difficulty level of the course is unknown at this time, but will be provided soon. Online tee times may be available at Northern Bay Golf Resort and Marina or at nearby golf courses, often at a substantial discount from the going green fees rate. Even though the information on these pages is typically valid, in some cases there will be mistakes. If you spot anything that needs updating, please fill this out. 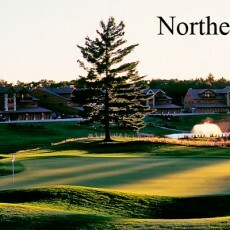 There is a Yelp.com page for "Northern Bay Resort - Arkdale, WI"
The score on Yelp is 4 out of 5. That score is an average of 3 ratings, and it is rounded to the nearest 0.5. Also note that sometimes Yelp excludes from that score any reviews that that it classifies as "not recommended."